Stay connected easily when you're on the go with the built-in Wi-Fi wireless connectivity (802.11b), which enables you to access email and browse the Web at hotspots such as at coffee shops and in airports, or in your office if you have a wireless LAN network. You can even retrieve documents from your main computer with the included WiFile LT software. The expansion card slot for MMC, SD and SDIO formats lets you insert a memory card from a digital camera and view photos on the large, color display; you can even can add transitions between photos and present them as a slideshow. The Palm TX handheld's compatibility with SD Cards up to 2GB lets road warriors carry a few favorite home videos and be entertained on long trips. With the included DataViz Documents To Go software, you rehearse your PowerPoint presentation discreetly in an airport, make last-minute changes to a Word document, and check the numbers in an Excel spreadsheet and update them on the spot. The Palm TX comes with support for native Word, Excel, and PowerPoint files. And with the included Adobe Reader for Palm OS, you can download and view converted Acrobat files. The Palm TX comes bundled with Pocket Tunes MP3 player for playing music files or Podcasts, which allows you to create and edit play lists, shuffle songs and navigate by album, artist or genre. The Palm TX also includes built-in software for viewing digital photos and video clips. And with MobiTV software (sold separately), you can view a wide range of television programs, including news, sports and entertainment, directly on the Palm TX handheld. Veteran Palm OS handheld users will immediately notice the new Favorites view, which provides easy access to applications, files, and folders. The installed Palm OS 5.4 also introduces the Files application, which enables easy navigation among folders and files. It uses the intuitive and easy-to-learn Graffiti 2 writing software to input data into the handheld (as well as an on-screen keyboard). Windows users can synchronize their calendar, contacts, tasks, and notes with Microsoft Outlook. 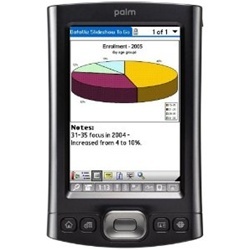 The Palm TX is compatible with PCs running Windows Windows 2000 (SP4) and XP (Outlook synchronization requires MS Outlook 2000, 2002, or 2003; sold separately), and with Macs running Mac OS 10.2.8 to 10.4.